Africa-Europe Foundation, The Hague, Netherlands. 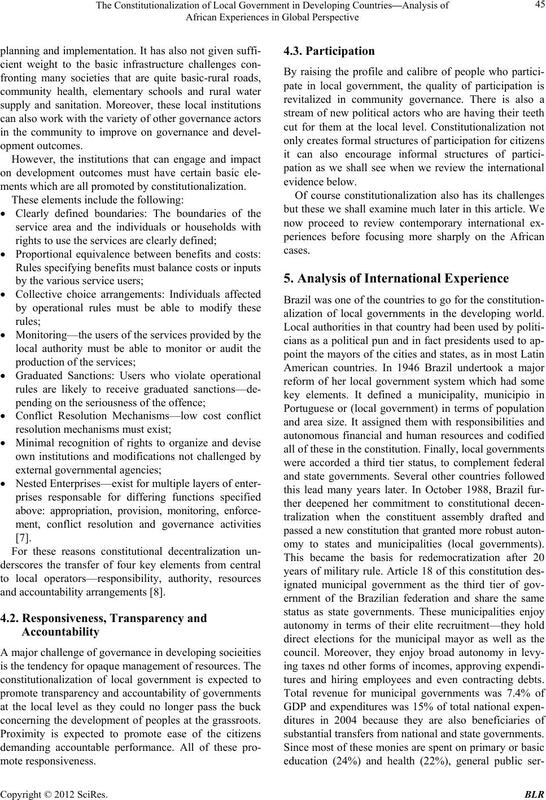 the interface between local government and local governance as well as the strengthening of intergovernmental relations. 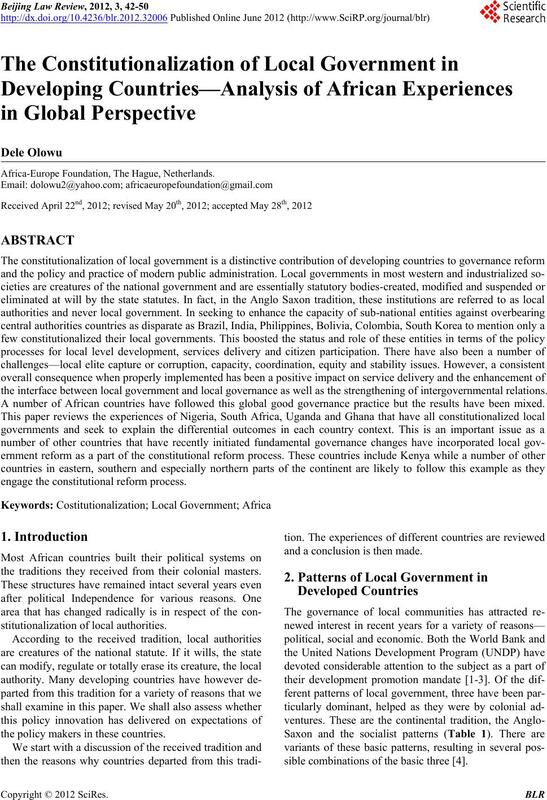 A number of African countries have followed this global good governance practice but the results have been mixed. engage the constitutional reform process. the traditions they received from their colonial masters. the policy makers in these countries. and a conclusion is then made. sible combinations of the basic three . Table 1. 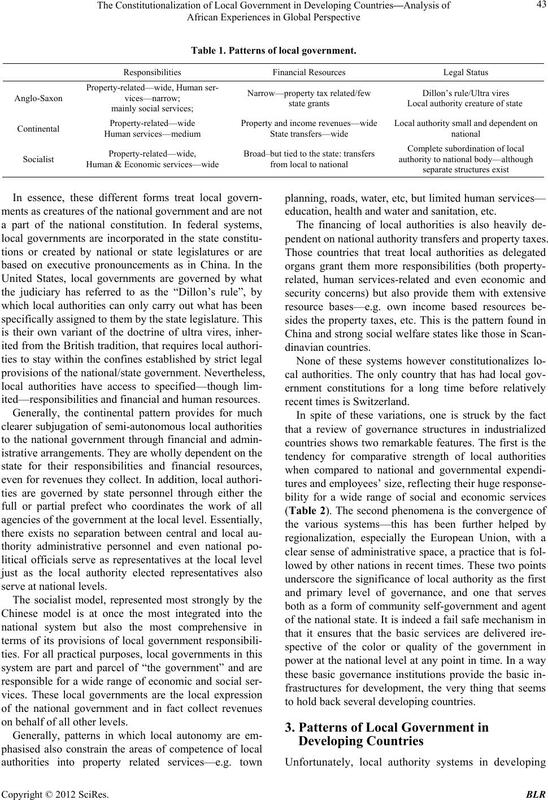 Patterns of local government. ited—responsibilities and financial and human resources. on behalf of all other levels. education, health and water and sanitation, etc. pendent on n a tional authority transfers and property taxes. to hold back several developing countries. Source: Kersting, et al. 2009.
in the 1970s as a part of the program of ujaamization. opment and governance with decentralist lenses. pulses for change from the national organs of governance. ments which are all promoted by constitutionalization. concerning the development of peoples at the grassroots. 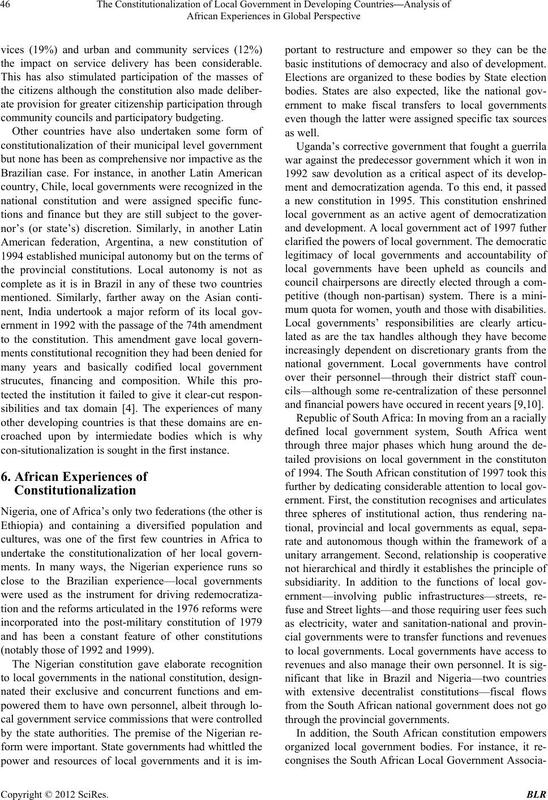 alization of local governments in the developing world. omy to states and municipalities (local governments). tures and hiring employees and even contracting debts. substantial transfers from national and state governments. 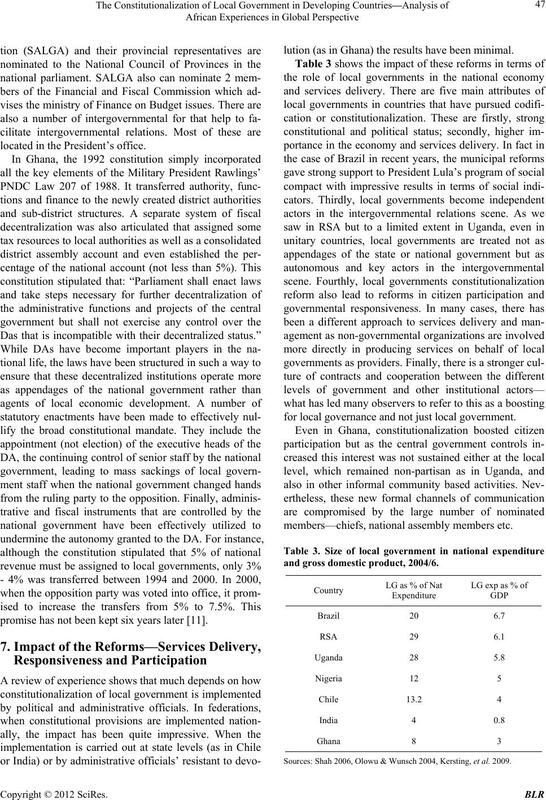 the impact on service delivery has been considerable. community councils and participatory budgeting. con-situtionalization is sou ght in the first instance. (notably those of 1992 and 1999). basic institutions of democracy and also of development. mum quota for women, youth and those with disabilities. and financial powers have occured in recent years [9,10]. through the pro vincial governments. located in the President’s office. promise has not been kept six years later . lution (as in Ghana) the results have been minimal. for local governance and not just local government. members—chiefs, national assembly members etc. and gross domestic product, 2004/6. Sources: Shah 2006, Olowu & Wunsch 2004, Kersting, et al. 2009.
est changes are costly to effect. personnel by all levels of government. handling fina nce and personnel ma tt e rs. provement strate gy . What we nt wr on g? 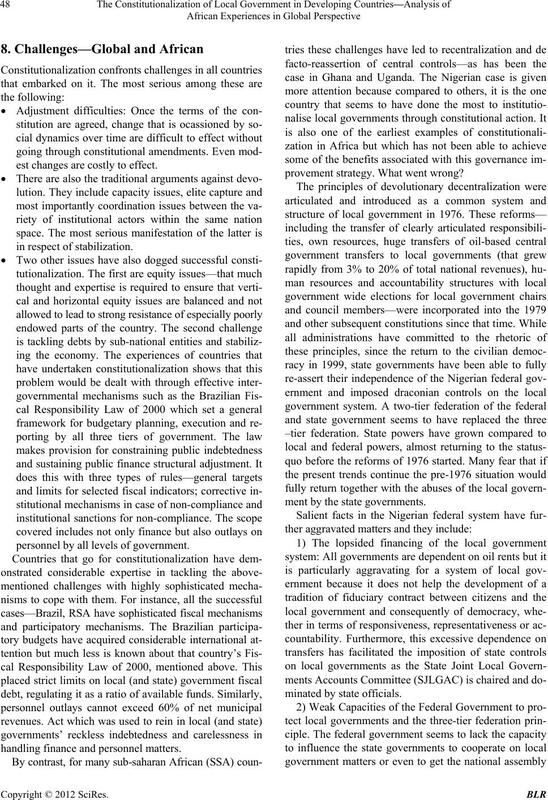 ment by the state governments. 2.810billion in the month of June 2010.
actually fought and won on the basis of performance. by the ruling party in most states. have devoluti o nary decentralization pol ic i es. in this paper—e.g. Brazil comp ared with Chile or India. critical role in sustaining this innovation. tinent in the north, Eastern, western and southern parts. 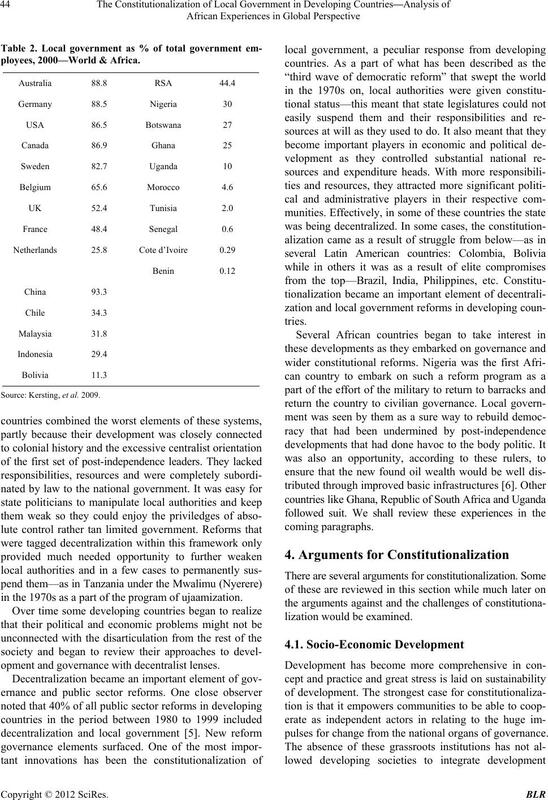 duction and Reform in Developing Countries,” John F.
and Development, Vol. 2, No. 4, 1982, pp. 345-357. Press, Michigan, 1999, pp. 87-113. 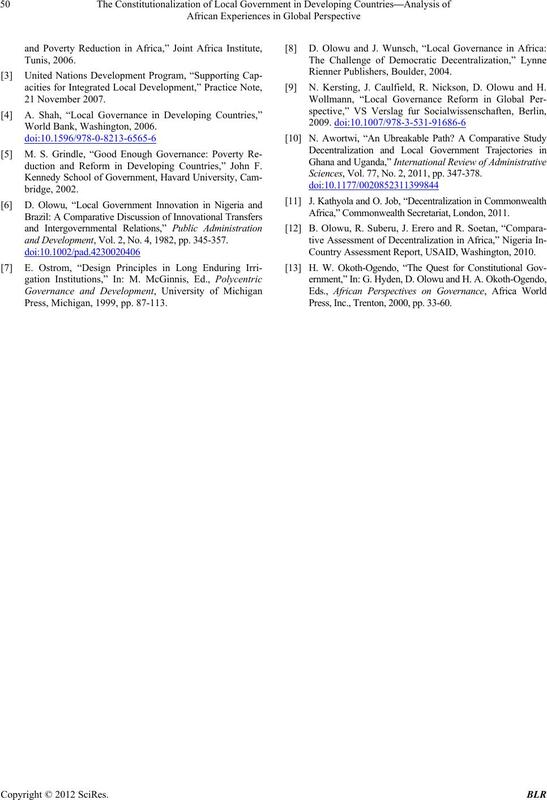 N. Kersting, J. Caulfield, R. Nickson, D. Olowu and H.
Sciences, Vol. 77, No. 2, 2011, pp. 347-378. Africa,” Commonwealth Secretariat, London, 2011. 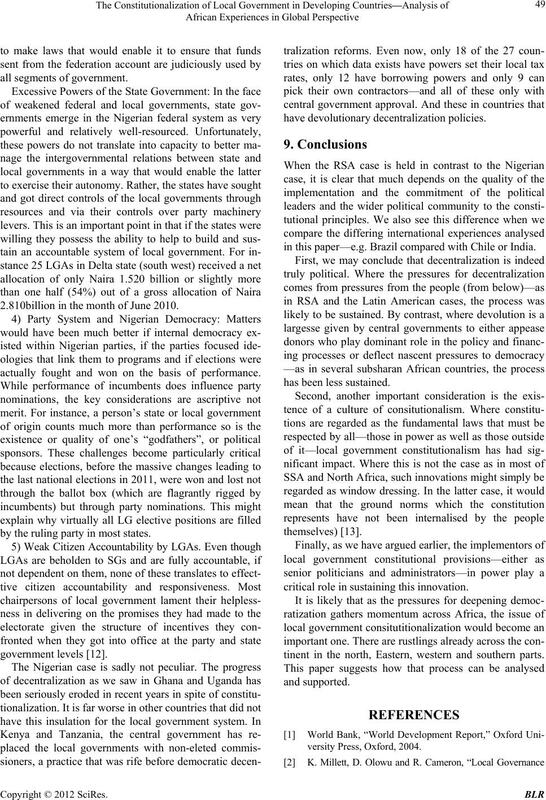 Country Assessment Report, USAID, Washington, 2010. Press, Inc., Trenton, 2000, pp. 33-60.